EAST RUTHERFORD, New Jersey (WABC) -- The Jets thanked their fans that showed up on Sunday, by once again imploding in the fourth quarter. 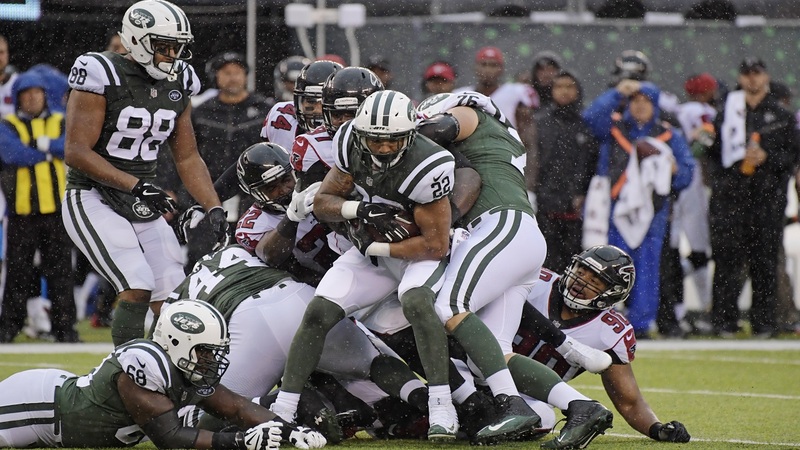 This time at the hands of the Atlanta Falcons 25-20, in driving rain and treacherous conditions at MetLife Stadium. Sunday's loss was the third straight for Gang Green, who have now dropped to 3-5 on the season. The Jets manage to be in their games -- to a point, then the bottom falls out as they implode late in games. In the monsoon conditions on Sunday, kicker Chandler Catanzaro missed two crucial field goals from 46 and 48 yards. Not being able to capitalize on turnovers played a crucial rule in the Jet loss today. Atlanta's Matt Ryan fumbled, and was recovered by Jordan Jenkins. If the Jets cashed in on the turnover, it would have been 10-0 in the early going. That was not to be. Atlanta would eventually drive 7 plays and 64 yards to tie the score at 7. The Jets had a 1 point lead in the fourth quarter, but were stung again by a missed field goal. After the miscue, Falcons running back Tevin Coleman busted free for a 52 yard run. 3 plays later Matt Ryan connected with Rutgers alum Mohamed Sanu for a 22-17 Atlanta lead. After the game the coach addressed his offenses inability to seize the opportunity of great field position. "We gotta put points on the board obviously, and we didn't execute at those points in time, but we gotta make field goals as well." All week long, the team focused on closing games out. After the game, the coach's disappointment was evident. "We played hard for the most part. It's disappointing not to win -- it's disappointing we didn't close it out." Bowles went on to say; "Too many mistakes in the fourth quarter. Can't happen. Can't put the ball on the ground, can't have timely mistakes, everybody's gotta play their brand of ball. Hard enough, not good enough." The Jets have to put this game behind them and focus on Buffalo. It's a quick turn around as they face the Bills on Thursday Night Football, at MetLife Stadium. The Bills are 5-2, and are coming off a win against Oakland.